UK authorities just hauled WikiLeaks founder Julian Assange out of the Ecuadorian Embassy, based on an extradition request from the United States. It’s a move that a lot of people have been waiting a long time for – particularly with regard to finally getting answers in the 2016 Trump-Russia election scandal. But the question must be asked: why now? There are two potentially plausible scenarios, so let’s lay them out. First there’s the doomsday scenario: new Attorney General William Barr fired Special Counsel Robert Mueller before he could get to Assange, and now Barr is seizing Assange to try to make sure the truth never comes out. Considering that Assange is being arrested just weeks after Mueller’s investigation abruptly ended under highly suspicious circumstances, and Barr’s obviously corrupt desire to protect Trump at all costs, this does seem plausible. Then there’s essentially the opposite scenario: the takedown of Assange is just the latest move by the non-corrupt elements in the DOJ to continue carrying out Robert Mueller’s gameplan, and Barr either wouldn’t or couldn’t stop the takedown from happening. We’ve already seen various DOJ prosecutors pushing forward with Mueller’s grand jury work against Roger Stone, and whoever’s financial records are being targeted by the subpoena of that mystery foreign government owned company. 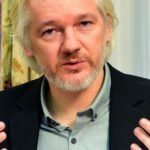 Legal experts are saying that it could take several months (or longer) before the Assange extradition process plays out and he’s handed over to the United States. In the meantime he’ll be held in UK custody, where U.S. investigators can petition to interview him. So if and when House investigative leaders like Adam Schiff ask to travel to London to interview Assange about the Trump-Russia scandal, we’ll see if the DOJ tries to work with or against such requests – and that’ll tell us why the DOJ made this move now.